Hit feedback: blood splash when player was hit, and number of damages floating above enemy when enemy was hit. Thrust and short distance slashes are now possible using left mouse button. Left mouse button still isn't necessary to perform long range slashes. Gamepad steering - now it should be possible to play with xbox one controller. Downloaded and tried the demo for 30 minutes. What's being attempted here is very ambitious, and if achievable, very VERY laudable. The gameplay reminds me very much of, "Die By The Sword." If featured orcs, ogres, ratmen, traps of nefarious means of being torn apart, a robust dismemberment system, and one could even beat up their enemies with their own severed off arm! It even came with a thoughtfully provided and extremely well designed custom-combo-moves editor. For several months, I tried VERY hard to master its mechanics. Tried as I might, I walked away from it, to try it only once more, before walking away from it forever more. The essential problem with that title, as with this one, is that one cannot ever develop a CONCRETE determination of knowing EXACTLY where that mouse is going to be. One might think, "Well, wait a minute, I know where it is because I can SEE on the screen where the blade is." Yes, but, that's NOT the problem, it's also knowing where it's GOING TO BE. The beauty of stances, is that one memorizes the starting and end motion of a swing. This allows the player to internalize a map of the swing zone. The stance/swing zone is both a blessing and a curse depending on its execution. Here's an example of where a game's default use of stance/zone was awful, as in "spammy" and "arcadey": Raven's Jedi Academy. And now, an AMAZING mod has been released for that very game that makes the melee experience AMAZING, Serenity Combat Engine. 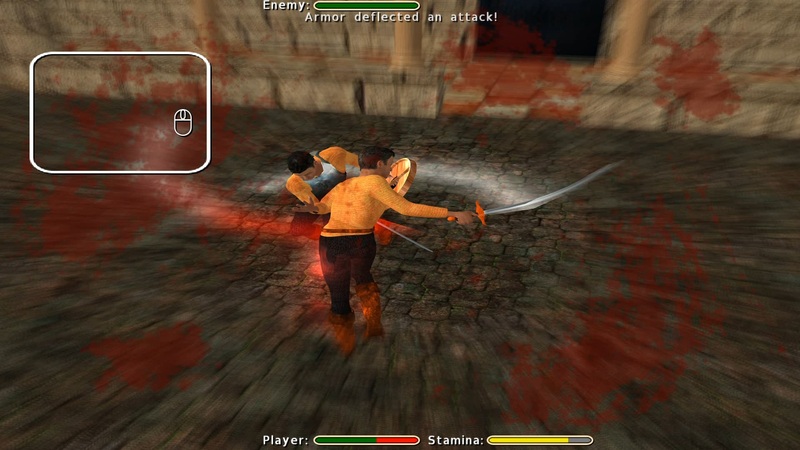 This game is indeed inspired by "Die by the sword". "The essential problem with that title, as with this one, is that one cannot ever develop a CONCRETE determination of knowing EXACTLY where that mouse is going to be." Not only you mentioned this problem. I wasn't looking to much about precision when playing "Die by the sword" so I didn't notice this earlier. Right now I have some concept in mind how to tackle this. I am not sure whether this work or not unless I try it. This may take month or two.